Love audiobooks? 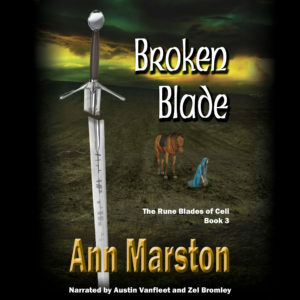 You’re going to lose yourself in the newly released audiobook, Broken Blade, by Ann Marston. This is the third novel in Ann’s wonderfully mesmerizing Rune Blades of Celi series. The production quality of the audiobook is unlike anything you’ve heard before, expertly narrated by Zel Bromley and Austin Vanfleet. There’s even a harp accompaniment to the Rune Blades ballad at the end, a truly magical ending to this audiobook that performs more like a radio-play than some jejune reading. Broken Blade is available in audiobook from Amazon, Audible and iTunes. Or if you prefer ebook or trade paperback, you can purchase directly from Five Rivers, or through your favourite online bookseller. Bug your local bookstore to stock the series. Why not spread the joy?